2. It’s actually technically about who knows you. If you have the right, relevant audience, then when people are asking friends of friends about your industry, Graph Search will connect them. Guess what that means? You should be asking vigorously of your customers, of your mailing list, of anyone relevant to your industry, to hit the ol’ Like button. 5. Add location data to your Facebook Page or else. Graph Search has geo-targeting built in. For that matter, make sure that your Facebook Page is as complete as you can make it for your business. As more is revealed about Facebook Graph Search, there will be more ways to take advantage of it, but this is a list of things you can do right now, today, to prepare. 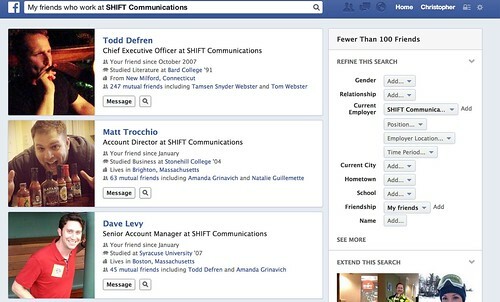 If you want to get in on the Graph Search beta as a user, Facebook has a waiting list here. What news waves should you surf?